This represents AMRAD's thinking toward the AMICON interim standard that you are now drafting. It also gives you our thoughts on local area and backbone networking issues. We have no problems with the ideas expressed on the telecon. Virtually everyone who is active on packet radio today is using the VADCG TNC, Bell 202 modems to afsk a vhf-fm transceiver with 5-kHz deviation and about 15-kHz rf bandwidth. Unless we stick with these parameters for the communications channel, the packet people will be hard-pressed to reconfigure by the time that Oscar Phase III-B is launched. It is a bit wasteful of bandwidth (as opposed to fsk), but that is a trade-off to allow people to use their pre sen t equipment. The re do no t appear to be any issues at this level. Everyone in North America is using RS-232-C, and others may use X.21. 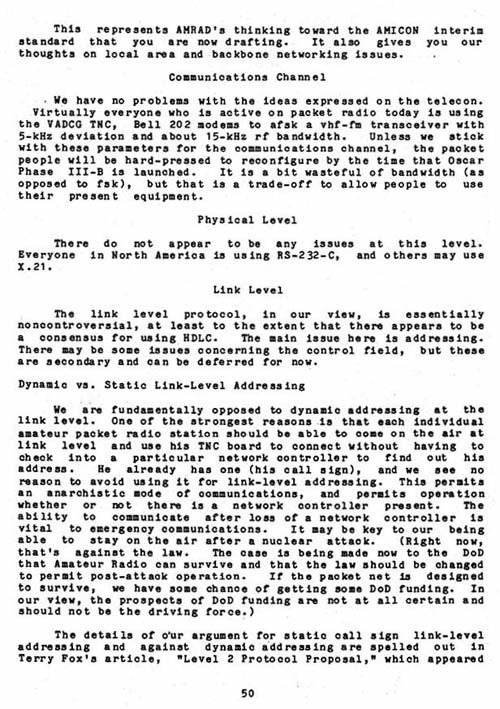 The link level protocol, in our view, is essentially non controversial, at least to the extent that there appears to be a consensus for using HDLC. The main issue here is addressing. There may be some issues concerning the control field, but these are secondary and can be deferred for now.